Fleetwood Mac are a British-American rock band formed in 1967 in London. Due to numerous line-up changes, the only original member present in the band is its namesake, drummer Mick Fleetwood. The two most successful periods for the band were during the late 1960s British blues boom, when they were led by guitarist Peter Green and achieved a UK number one with “Albatross”; and from 1975 to 1987, as a more pop-oriented act, featuring Christine McVie, Lindsey Buckingham and Stevie Nicks. Fleetwood Mac’s second album after the incorporation of Buckingham and Nicks, 1977’s Rumours, produced four U.S. Top 10 singles (including Nicks’ song “Dreams”), and remained at No.1 on the American albums chart for 31 weeks, as well as reaching the top spot in various countries around the world. To date the album has sold over 45 million copies worldwide, making it the sixth-highest-selling album of all time. Following the release of Rumours (1977) and Tusk (1979), Fleetwood Mac released the album “Live”. It was the first live album from the then-current line-up of the band, and the next would be The Dance from 1997. The album was certified gold (500,000 copies sold) by the RIAA in November 1981. Of particular note were three new songs — Christine McVie’s “One More Night”, Stevie Nicks’ “Fireflies”, and a well-harmonized backstage rendition of the Beach Boys’ “The Farmer’s Daughter”. The latter two were released as singles, but only “Fireflies” charted. 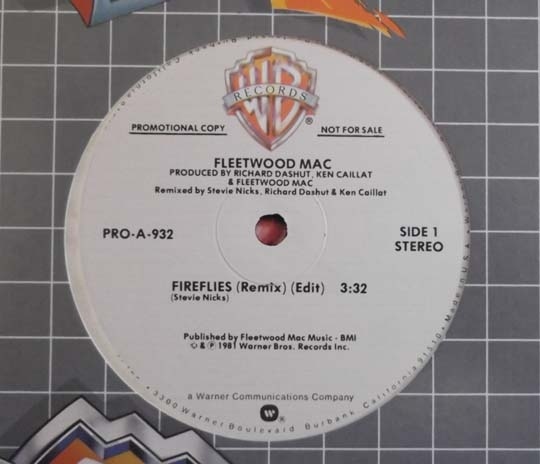 The studio version was remixed by Ken Caillat, Richard Dashut, and Stevie Nicks for the US Promo 12″ release.